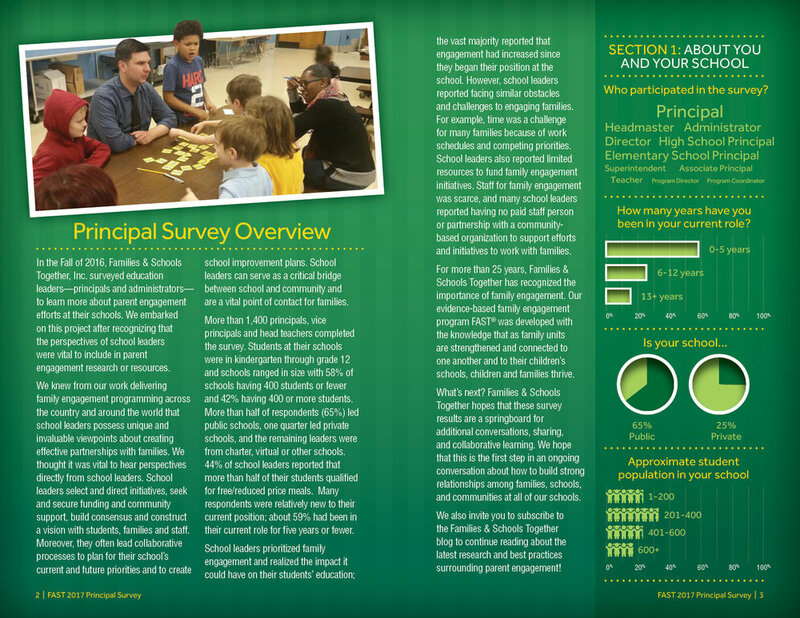 In the fall of 2016, Families & Schools Together, Inc. surveyed education leaders—principals and administrators—to learn more about parent engagement efforts at their schools. They embarked on this project after recognizing that the perspectives of school leaders were not well-represented in parent engagement research or resources. Once the survey results came in the realized that we needed an engaging way to share the results with the community that it would help most — the schools themselves. Upon starting this project we knew this was going to be a tall order. Organized hundreds of responses and make the results understandable and meaningful for the reader. That's where the infographic approach came in. I broke up the copy with integrated infographics that would tell the reader the information at a glance so they can understand the material covered and find relevant date easily. Overall this piece is not only eye opening but functional too.